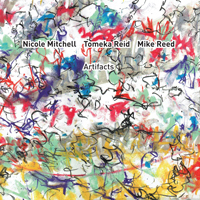 Artifacts was conceived by cellist Tomeka Reid as a way of rediscovering the vast songbook of the AACM (which, as this blog has covered extensively, is celebrating its 50th anniversary this year), and the trio’s debut album brings together a second-generation AACM dream team, with Nicole Mitchell on flutes and Mike Reed on drums. The trio’s sound is a throwback to the great Air, and captures the free improvised spirit of that earlier group. The album is packed with classic and little-heard gems from the AACM library, including two Steve McCall-penned cuts from Air’s catalog, “B.K.” and “I’ll Be Right Here Waiting…” Reed had already recorded McCall’s “I’ll Be Right Here Waiting” on his 2010 Loose Assembly recording with Roscoe Mitchell, on which Reid also played. Here, however, with a lineup closer to the original’s, the fragility of McCall’s melody really shines. Aiming to breathe life into these dormant compositions, the trio kicks things off with Braxton’s “Comp. 23B,” bringing a thrilling lightness to the proceedings. The trio follows Braxton with Roscoe Mitchell’s “Jo Jar,” a propulsive 50-year-old blues tribute to Joseph Jarman, brought to life here with shuffling drums and a fine solo by Reid. Fred Anderson, who passed 5 years ago this summer, is represented by “Bernice,” which is coupled with Jeff Parker’s “Days Fly By With Ruby,” itself an homage to Anderson. The trio combines both into a lengthy meditation on the AACM’s deep history. Mitchell steps to the fore with a jaw-dropping solo on “B.K.,” leaping and fluttering before handing off to Reed for a quick drum solo. It’s easy to forget how rare it is for Reed to take the spotlight, and his solo is an apt tribute to McCall. I can’t say exactly why, maybe it’s just hearing these three musicians cut loose in a free trio, but I absolutely loved this record from start to finish. Mitchell, Reid, and Reed, all highly democratic and collaborative players, have performed together for well over a decade. The three click seamlessly into a telepathic performance that both evokes and expands the AACM spirit.